Let’s look at the two proposals. Egypt, acting as the United States normally does, worked out the details of their ceasefire idea with Israel primarily. The deal reflects the Israeli and Egyptian agenda: it mostly follows the formula of “quiet for quiet,” essentially bringing back the status quo ante of early June. It offers Hamas a vague promise of future negotiations to address the siege of the Strip. But this is hardly something Hamas will put stock in. The 2012 ceasefire agreement, which was negotiated by then-Egyptian President Muhammad Morsi, a man much friendlier to Hamas than the current Egyptian leadership, also made such a promise and it never came to anything. Finally, Egypt says it is willing to open the Rafah crossing between Gaza and Egypt more widely but only if Hamas allows PA security to police it instead of their own people. It’s not hard to see why Hamas viewed that offer, and their exclusion from the talks, more like a call to surrender than a ceasefire offer. It’s because that’s what it was. The offer was likely made with the expectation that Hamas would refuse it. That is one reason, along with the fact that I don’t see them getting a better deal from continued fighting, that I thought Hamas should have taken it. But it is perfectly understandable that they did not. Hamas recently confirmed their terms for a ceasefire. They basically amount to lifting the siege Israel has imposed on the Strip for the last seven years, and the release of all the prisoners Israel arrested last month during their sweep of the West Bank while they were hiding from the Israeli public and the world the fact that the three youths they were ostensibly searching for were already dead. In exchange, Hamas would agree to a ceasefire. Those are without a doubt terms Israel, and Egypt for that matter, will never accept. They won’t because they don’t have to. Each of them, by themselves, is far more powerful militarily than Hamas. Together, they are even more so, and they have the backing of the United States, quite openly. More discreetly, they also have the backing of much of the Arab leadership in Saudi Arabia and most of the Gulf states, which, with the exception of Qatar, generally despise Hamas and the Muslim Brotherhood, Hamas’ ideological forebears. Therefore, Israel and Egypt will follow the most basic rule of international politics: might makes right. They will ignore minor details like peace, security for both Gazans and Israelis, and most of all, international law. They will do this because they can. But really, what is Hamas demanding? That they be set free from a crippling siege that has remained in full force with only minor and occasional amelioration through the ceasefires and flare-ups alike. That seems like a perfectly reasonable demand, an expectation, even, especially since Israel claims that it is no longer an occupying power in Gaza. Inside, that may be true, but Israel controls the airspace, the offshore areas and the overwhelming majority of Gaza’s borders, except for the southern one, which Egypt controls. It permits only limited amounts of supplies into the Strip, bars many things like chemicals and building materials entirely and allows almost no exports. According to most international law experts, Israel has the responsibilities of an occupying power proportionate to the control it exerts. Thus, it is not responsible for internal policing of Gaza, but it is responsible for the effects of its control—meaning the siege is illegal. Hamas, and most Palestinians, surely see the demand to lift the siege as a minimal one. Hamas is not, after all, demanding that the entire occupation regime be lifted for a ceasefire to take place, nor that Israel, for example, repair the damage it has done to Gaza’s only power plant or compensate Gaza for the destruction of its airport. But the majority of Israelis see the siege as a defensive measure. They believe lifting it will enable Hamas to reload with much more and better weapons and then they will strike much harder and might, at that point be able to deliver a real blow to Israel, something far beyond their ability right now. Most Israelis do not see the Egyptian proposal as a Hamas surrender, but rather as a very reasonable return to the status quo ante. Israelis believe their leaders when they say that they are not targeting Gazan civilians, despite the rather conclusive evidence to the contrary (such as bombing an open beach with children playing on it, destroying a hospital with patients in it, bombing the homes of Hamas leaders with their families inside, etc.). Palestinians see the death and destruction of civilians, homes, and Gaza’s infrastructure as justifying firing rockets at Israel. 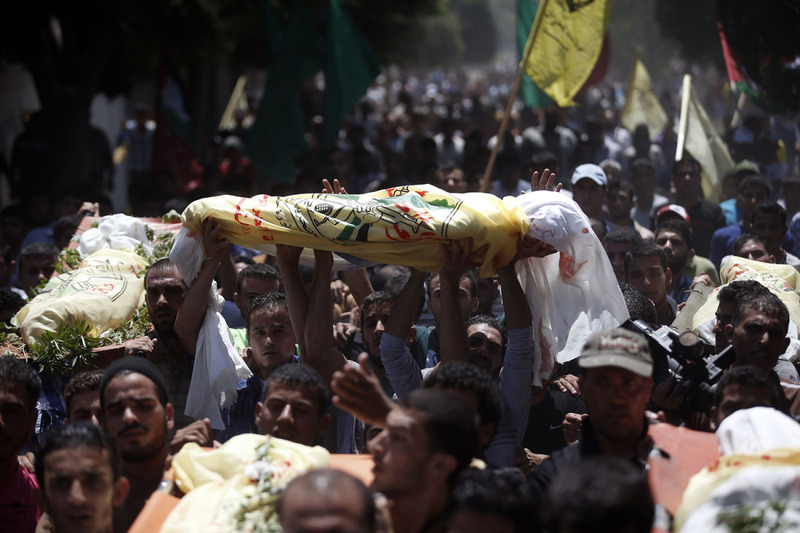 Israelis see Hamas as willing to sacrifice its own civilians in order to kill Jews. Palestinians see Israel as offering them a choice of being bombed to death relatively quickly or starved to death more slowly. The point is not whether one view or the other is right or wrong (we all obviously have an opinion on that, myself included). The point is that these are two completely irreconcilable views. When we combine that with the massive imbalance of both political and, especially, military power involved and the sense both sides have that they cannot afford to be seen to be letting the “violence of the other” dictate the terms of the ceasefire, we see the impasse. So where does that leave us? Ultimately, it is more than likely that Israel’s overwhelmingly greater ability to cause death and destruction, along with the fact that Hamas and Gaza in general have very few countries willing to stand up for it in the international arena, will force Hamas to accept a deal that pretty closely resembles the one they just rejected. But all that will do is reset the clock to tick down to the next round. If there were a genuine desire to find a way to stop this endlessly repeating loop, there would need to be forceful international mediation. Such mediation cannot come from those countries which stand with Israel against Hamas (Egypt, the US) nor those who have the reverse position (Turkey, Qatar). It can only come from an international delegation, either under the auspices of the UN or in the form of a committee from a variety of countries. There would need to be international guarantees and sanctions applied to both sides (and, crucially, actually enforced) for violations of any agreement. That, of course, is not something Israel would ever accept. It has no reason to sacrifice its impunity, because it has might – militarily, economically and politically – on its side. And as long as that is true, it simply has no good reason to moderate its position. In this regard, it acts like any other country. And the ineffectual Hamas rockets, terrifying though they may be to so many in Israel, are not coming anywhere near giving Israel any incentive to change. The bottom line is that it is the United States, which unconditionally runs interference for Israel in the Security Council and which arms Israel and completely ignores the fact that Israel uses U.S.-made weapons in blatant contravention of U.S. law that is the engine that keeps this going. They will support Israel in their refusal to allow any other outside party to mediate, and will certainly ensure that Israel retains its impunity. And the U.S. will do this against the better judgment of its President and Secretary of State, both of whom are well aware that the security of Israelis and the very lives of Palestinians both depend on ending the 47-year old occupation, lifting the siege of Gaza and allowing the Palestinians their freedom. Such is the effect of domestic politics in the United States and it is playing out in blood in the Gaza Strip right now. So what Bibi should do tomorrow morning? Tell Hamas that from tomorrow every ship can go to Gaza without any interference from the Israeli navy? What do you think will be the outcome in the next 10 years? Maybe thats the time for serious negotiation with Hamas for 1 month or more? Generally you are right but for tomorrow morning any solution to stop the violence connect to Gaza?